The Scripture Lady loves creating Bible verse games for kids! 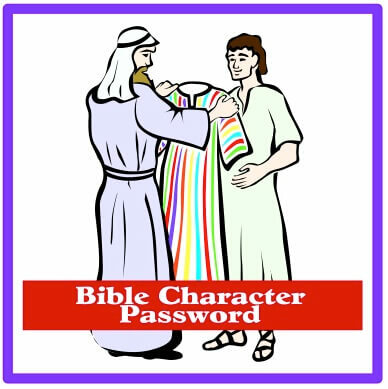 Here is one called “Bible Character Password” to help learn Psalm 119:11. I love trying to figure out a good mystery. Maybe I should have been a detective. Trying to guess what a clue points to can be very fun. Here is a fun Bible school activity I think your kids will like that has a reminiscent feel to the old TV show game of Password where clues are given in order to reveal the hidden word. Play this activity for Sunday School kids to help them memorize Psalm 119:11 and you have a winning combination. Psalm 119:11 says, “I have hidden Your Word in my heart that I might not sin against You.” Do you like to hide stuff? You know, like in a special place where no one can find your special treasure? God’s Word, the Bible, is the most special treasure you could ever have and the best place to hide it is in your heart. In other words, you need to memorize it and really know it well so that it can change your life from the inside out. Some of you know some Bible verses and some of the great stories and people of the Bible. Today, we are going to play a game called “Bible Character Password” to see just how much of God’s Word you really have hidden in your heart. I have a set of clues I am going to give that describes an important person in the Bible. I will give one clue at a time to each team. The team I give the clue to will have 10 seconds to try and guess who the clue is referring to. If your team is successful, you will earn 100 points. If your team is not successful, the other team will be given an additional clue and then they will have 10 seconds to guess the Bible person. Whoever guesses first will get the points. After each successful guess, I will pick someone from the team that guessed correctly to recite Psalm 119:11. If that person says the verse right, then they will earn their team another 100 points. By the way, if no one guesses the Bible Character from the clues given, no team earns points for that set of clues. OK! Let’s play! You might want to recite Psalm 119:11 over several times as a group to help them memorize it. This game can end up going slow or fast according to your kids’ knowledge. Either way, it’s a fun way to get them to memorize Psalm 119:11. You can give the clues in any order you would like. Some clues are easy and some are difficult. Abraham: Great faith, stars, promise, Sarah, Isaac, Ishmael, Lot, sacrifice of son. Jacob: Deceiver, 12 sons, wrestled with God, Esau, Isaac, 2 wives. Joseph: Slave, dreamer, 12 brothers, coat, Egypt, jailed, Potipher, Jacob. Moses: Special staff, desert wanderer, prince, burning bush, Red Sea, Commandments. Samuel: Godly mother, dedicated at birth, heard God speak, Judge of Israel, wicked sons, anointed Saul as king. That would be fun just for a review game. Thanks.